We had our family good luck meal today. Did you know that black eyed peas stand for good luck? If you eat cooked greens it means you'll be financially stable. We had pork too (but I didn't eat any) and pork represents progress. Corn sticks are just plain good. Do you have a good luck ritual for the New Year? p.s. The giveaway is open until next Wednesday. 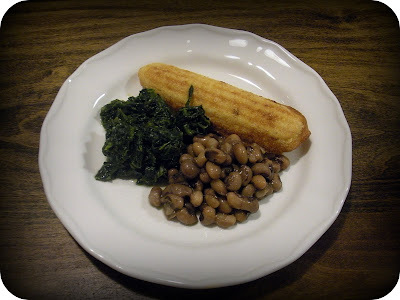 you're the second blogger to post black eyed peas for NY! thanks for sharing its significance, kat. normally i fix posole. this year it was mimosas! happy new year. Here in PA our New Years Good luck dish is Pork, sourcrout, and mashed potatoes. It's an acquired taste for sure.